Tracking yourself is extremely underrated. When you decide on a goal but have no tracking system in place your chances of reaching that goal are dramatically reduced. I have seen it time and time again with myself, my students, my business, my health and the evidence is everywhere. I am going to give some examples to strongly persuade you that tracking your practice and progress when learning guitar (or anything for that matter) will make all the difference. As a young teen I took up guitar and drums around about the same time. With guitar I decided to teach myself and with drums I signed up for formal tuition. With guitar I would watch friends whereas with drums I worked from a book that had specific exercises. 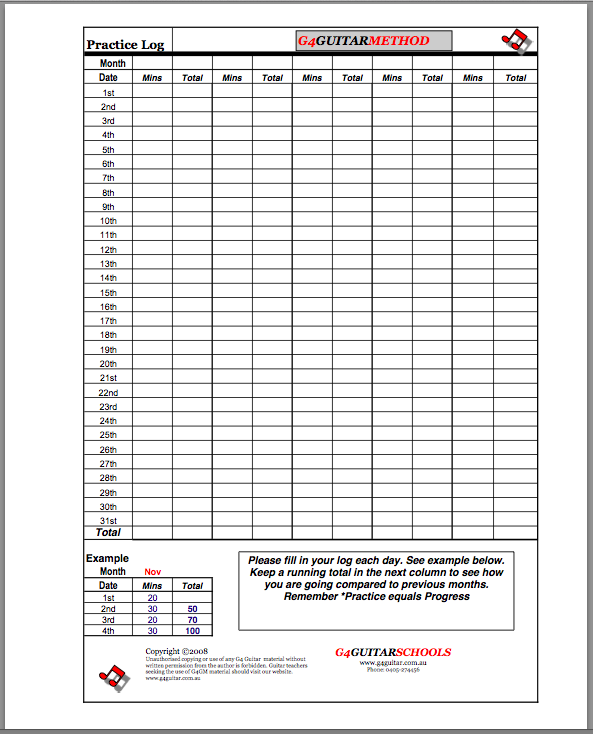 On the drums I was given a set number of exercises to complete each week so I was able to clearly track my progress through the book. A year later I was drumming professionally (at 14yo) and my guitar playing was going nowhere. Although I really enjoyed the drums the guitar was more attractive but I needed help. I didn’t realise it at the time but I had succeeded on drums because I was tracking my progress thanks to my teacher. My guitar teacher helped me to do the same for guitar and a year later I was playing professionally as a guitarist and also started teaching guitar. When I began teaching I still did not realise that tracking student progress was the key. For a number of years I simply gave students riffs, songs, scales, chords etc and hoped they would do the practice. I eventually worked out that great teachers and coaches had something in common. They tracked the progress of their students. Whether it be piano teachers who use a book with specific milestones or a swim coach who records times or a weight loss trainer who measures BMI they all seemed to be getting results. I must confess that I do a lot of reading so this realisation was not my idea. I probably read it a hundred times in various ways before I got it. When I did finally get it I knew I was about to join the ranks of successful coaches. Its a simple formula but does take work. The reason measuring works is because it keeps you motivated. If you say that you want to be able to play guitar by 2013 well enough to be able to play say 5 of your favourite songs that is a nice goal. Problem is that along the way you are likely to get frustrated, bored or just feel like you are going no where. If you track the amount of time you practice each day even if you don’t feel immediate progress you will feel good because you can see the investment of time you are making. This keeps you motivated. I know this to be true not just for myself but for my students. I made it compulsory for my students to write down their practice times each day. A few ignored my requests and they were the same ones who gave up. Almost every student who tracked progress stayed the course. Cause and effect at its best. But to be scientific you need to look at it from another angle to be sure. You could say that those who used the practice log were just more motivated to begin with but I was able to observe other teachers who did not use practice logs or enforced them to varying degrees and they on the whole had greater drop out rates. Some teachers had inspiring personalities that kept students hanging in there but the students were usually only inspired in the lesson but not to practice at home. They enjoyed the lessons and liked their teacher but were still not confident about their ability to learn guitar. You see the student needs to become confident in their ability to learn guitar and that comes from knowing they are in control. When you teach a student to track their own progress they begin to correlate that with progress. Knowing that your progress is in your hands and under your control is ultimately what drives you to work harder and eventually achieve your goals. 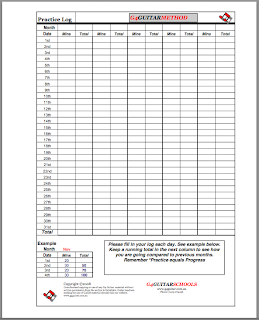 To help you get started follow this link to download a FREE PDF to start tracking your practice times.